Vibrant Technologies is a leading reseller of remarketed and used Dell Storage Equipment from tape to drives and disk trays as well as Dell Equallogic SAN products. We've been dealing in used data storage hardware since 1998 and carry a multi-million dollar inventory of quality, tested and guaranteed hardware - ready to ship! Contact us for pricing and info or Request a Quote today on Dell Storage hardware. Dell offers a variety of data storage and backup solutions, including network attached storage, direct-attached storage, storage area networks, and software-defined storage. 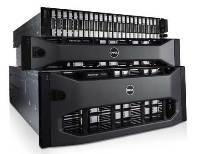 Dell NAS storage solutions use iSCSI and Fibre Channel technology. Direct-attached storage arrays are a cost-effective solution optimized for smaller-scale storage consolidation and high business continuity. For more information on used Dell Storage hardware, please contact Storage sales at sales@vibrant.com or call 1.888.443.8606.